Jeff Capel has the Panthers rolling, and they roll into Syracuse today for a key ACC matchup. Lets go Pitt! This is a tough match-up for PITT. Outside shooting challenged and not a good offensive rebounding team.. PITT can hang with Cuse but they will need JWF to swish a few shots from outside. I can see lots of charging calls that go against PITT. X Johnson is good but he can run amuck at times like this… Think transition basketball!! I think Capel will have a good plan of attack for the cuse zone. Execution by the players will be a work in process. Hard to find a station to cover this game on PCT. Especially for a recently good team. But they are on the bubble for the Tournament and this will help. That’s why an upset for us on Tuesday would be so great for us come March. I believe Duke’s PG is still out with an injury. That Duke – Virginia game will be fun to watch at 6:00. They called traveling on PITT when I’ve seen plenty on Syracuse. Is Buddy Jim’s grandson or what? Please put Frame on the bench and keep him there! Can we please stop with the turnovers? – ugly basketball no matter how young this team is. Pitt is trying way too hard to get the pass to the foul line… the one that begins to break down the 2/3 zone. If we don’t start driving the lane and shooting better, this one is a rout. The hoopies meanwhile are beating Kansas. Pitt cannot buy a basket. This may be the worst beating we take all year. Should be down 30. Great job to cut this lead. These guys don’t give up! That is why Jimmy is playing Buddy – he knows they will win this game easily. Jimmy listened to Kham and Brown’s interviews on how Pitt would break the zone. Insight that helped cuse defend better. That is why Duzz is so secretively running the FB program. Nice comeback by Pitt. Love the fact they never give up! Hard to believe we are down only 3 with Mc with no points. We have a snowballs chance. Pitt fans can have a pretty solid slate of TV today. Basketball game at 2, Darrin Hall and Alex Bookser (Qadree Ollison is out) in the Shrine Game at 3 on NFL Network, and George Aston in the NFLPA Bowl at 5 on FS1. — I don’t get having Ellison be the guy for the entry pass on the foul line… Shouldn’t that be someone who can shoot it? —Great to see the fight in this team. They could have let it get away, and it still might, but they hang in there. Pitt wrestling gets first loss vs #4 Ok State, 36 – 9. I was watching it on ESPN3. danh72 knows his basketball. But Wilson- Frame is the closest thing we have to a shooter, so we’ll need him to knock a few down to loosen up the Syracuse zone. We clearly cannot penetrate and score. Brown needs to hit the weights in the off season…. If McGowens ever gets going here we can win this one. Hey Jeff. Time out Pitt!! This is just a terrible matchup for us. Ain’t over til it’s over. Not every game will be like FSU, I get that. But they look intimidated. If Mc Goeens is invisible we obviously don’t stand a chance. But one 3 could get him going….I just wish we didn’t look so afraid. Kham revealed Pitt’s entire gameplan on how they would attack the cuse zone in a lengthy interview – warranted him sitting on the bench, imo. dan – I forgot to mention the off ball movement. My son is screaming about that. Surprised Capel hasn’t done something. Lots of bystanders. That’s really what I meant. You have to move without the ball. You r son is well schooled. Don’t let this loss, or the one to Duke on Monday burst our bubble. We are going to be undermanned against most teams we face this year. We have very little inside scoring and no consistent outside scoring threat. Give Capel time. He’s accomplishing a lot with a limited arsenal of players. No foul? Refs seem to have swallowed their whistles at our end. Jimmy B whining his way to getting calls again. But turnovers killing us this half. Embarrassing loss. Sorry guys, no other way to put this. I think you’re overreacting Erie. Playing a better team in their hot as hell dome – tough place to shoot generally. Young team still learning. And 8 minutes to play yet. My half-full New Years resolution. 30% shooting from the field and 50% from the foul line won’t beat a D2 team. I should have gone golfing. It’s going to be a season of ups and downs with this team. I like this team better than the last few. I’m willing to ride with them. Pitt’s big guys (to the extent any one wants to say they have any) were totally intimidated. The lack of motion on offense is infuriating. I hope they can keep it within 10 as it would be respectable. Lets go! Move without the ball! Box out! Buddy Boheim playing better than all of the Pitt players except X-man. Showing more energy now. But way too many open looks for Cuse. And not enough transition points by Pitt. After trailing all half, WVCC upsets Kansas on final shot. And the hoopie fans storm the court. The cuse fans will not after beating Pitt today. —This Pitt team doesn’t have the weapons to attack to Cuse zone. —I looked at this game as a chance for the Pitt frosh to see the Orange zone and give us a better shot to beat the Orange at the Pete. For one thing, I don’t think we see Ellison playing at the foul line at the Pete. Though Coach Capel does need to recruit a player with the size and skills for that role. —A couple of times when Xman blew past his man and scored in a flash were really impressive. —Battle is a heck of a shooter for Cuse. Bad match-up for our Panthers today. You beat the zone with three point shooting and from the foul line. Neither of which we are very good at. Jaime always seemed to have a guy that could do into the middle of the zone, make a shot or get the ball down low. Wannamaker and Patterson comes to mind. We don’t have that guy right now. Maybe Toney in the future. The zone definitely takes X and Trey out of their games, almost impossible to drive the hoop. Just not enough firepower underneath and from the three point line. Hopefully the rest of the ACC doesn’t start playing more zone against us. Just a terrible matchup for us. But they never quit. Played hard to the end. Just close your eyes and think back to any ACC game last year, and you won’t feel as bad about today. Watching Duke play a tough 2/3zone. Pitt will see lots of it Tuesday eve. Duke beat Virginia 72 – 70. Glad we won’t be playing them after a loss. JWF did show his worth to this PITT team today. Give him credit for that.
.@Pitt_FB's Darrin Hall Jr. finds daylight and scampers for 39 yards! Just another “anomaly” long run by Hall. From the tip off to the final buzzer every ACC opponent of Pitt should play zone defense period. After the Duke, Virginia and the Louisville games this year(which will be loses) Pitt would have a tough time winning 3 more games if everyone played them exclusively with a zone defense. If that would be the case, hopefully with Capel’s coaching the team could adapt and find adjustments to beat the zone (improvement, Something Stallings never seemed to be able to do) and hopefully not every team would play the zone as effectively as Syracuse or Duke. 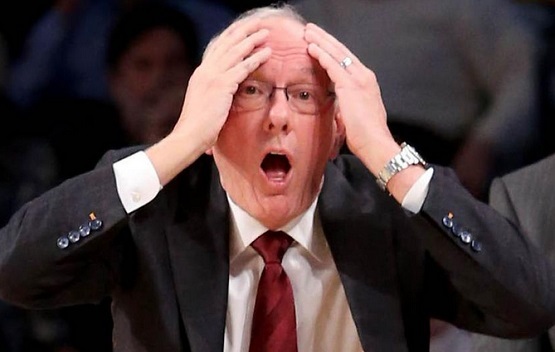 Boeheim recruits players to play that zone …. tall and long. The good thing is Pitt has just seen the best zone they will face all year. The bad thing is that Cuse is by no means the best team they have seen. Duke is next and we already saw how good UNC can be. UVa and VT are down the road. That’s right Mark. When you hear Syracuse basketball you automatically think of two things.. First, their whiny head coach and second their funky zone defense. Another thing to remember is that PITT hung with a good Syracuse team on the road, that just beat the #1 team in the country (Duke) A team that jrn is right about, they are not a good match-up for PITT. Like I mentioned earlier, Parker Stewert could have helped PITT in games like this. Those few others are VT, Wisconsin, UCF (in 2019) and Missouri. Does anyone else miss Reed’s Sunday morning podcast? I sure do. Watch Halls run above, he’s the real deal and just might be a real steal in this next draft. << I’m a poet and didn’t know it. Michelangelo is doing a real good job stepping into Reed’s shoes…. but I still would like to see Reed spin out an article every so often. Isn’t that the POV’s modus operandi is? A fair and well balanced team/family. I don’t see much in Hall that will make him have much chance at the next level….and nothing in THAT run. Not saying he has no shot as I was impressed by some runs during the year that required vision and some level of jump step cut to get him a chance to use his very good speed. Now, Ollison I think should have a few successful years somewhere. And actually that run yesterday is sort of like those runs I am referring to as I just watched it on a bigger monitor. The line did a good job creating “a” hole but I don’t think it was where the play was originally designed to go. Maybe, but I won’t be at all surprised if Aston gets drafted. His blocking and tenacity are really special. Someone needing a guard will draft him in the late rounds. He’s not a tackle. Hey Tvax my friend. It’s been grilled into our heads that Hall doesn’t have any wiggle, well he show great eyes on that run and hits the hole with speed and power along with a little wiggle. I guess if you take away that run he didn’t have that great a game. How many times are we going to take away a Hall run until we realize this young man can tote the rock? Ike, I too miss Reeds podcasts. It wasn’t so much the wiggle with Hall as much as his eyes. He opened them and saw the light…. the daylight! Powell with another job well done. He was another good hire by Pat or King Pat…. glad the word “a” hole gets through here….I need to use it more often. Scott Barnes, Franklin, Stallings, SP, etc. Hall’s assets are he runs really hard every carry, and he has speed. Anyone wanting to meet up for a soda pop or snacks prior to the Duke game let me know..
Hemmingways anytime from 5 – 8:15. Farmers High is holding a table in the back room for us. You threw me Fran – I was thinking at first that you were referring to the Duke football game….